Computer World offers Products & Services such as hardware, software, laptop, desktop, speakers, printers, software DVDs, PC DVDs, Games DVDs, PS2 Games, Xbox360 Games, and all accessories. 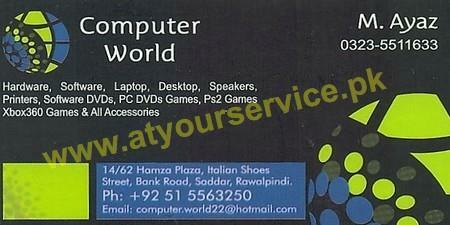 Computer World is located in Hamza Plaza, Bank Road, Saddar, Rawalpindi. Products & Services offered by this business are hardware, software, laptop, desktop, speakers, printers, software DVDs, PC DVDs, Games DVDs, PS2 Games, Xbox360 Games, and all accessories.